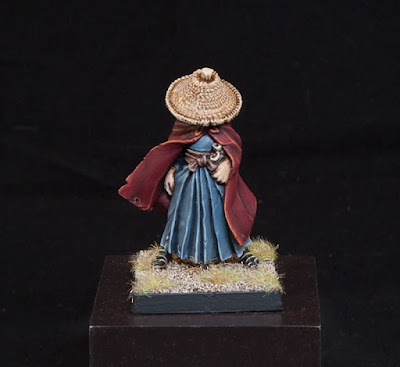 My latest commission was for something rather unique, an Asian themed wizard for Dungeons and Dragons. This model looked great and was a joy to paint. 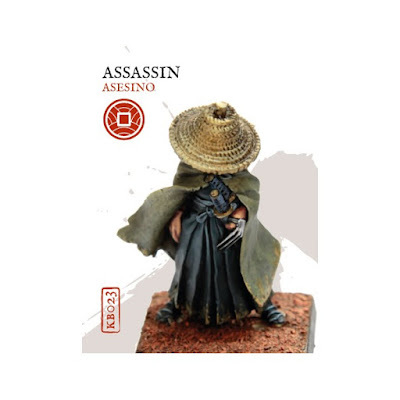 The actual base model is meant to be an assassin and had a claw weapon on one hand and swords poking out from his robes. My client wanted him to be a wizard though so it was up to me to suitably convert him. As far as conversions go it was a fairly simple one and merely required me cutting away the claw weapon from his hand and robes. This weapon covered most of his hand though and the model was cast in pewter so that meant some resculpting was in order. I cut away even more of the hand then I needed so that I would have some room to sculpt the valleys in between the fingers. I think it turned out pretty good. Luckily for me the sword handles were separate pieces, so all I needed to disguise were the scabbards. Since this guy was supposed to be a wizard I figured it would make since to turn them into scrolls. A little bit of greenstuff work later and I was ready to paint him. I painted the inner robes first and went for a blueish grey. Originally I was going to use Shadow Grey as my main color, but decided that it was too blue for my tastes, so I mixed in some Dawnstone to desaturate it a bit more. This was then shaded by mixing in black and washing it into the folds. After a bit of light blending and touching up I moved on to the high lights, which were once again my base mix with some Ulthuan Grey mixed in. I did two layers of highlights to try and give it a bit more depth. Next up was the cloak, which my client wanted to be red. Red cloth is actually a lot of fun to paint for me. I started with a base coat of Khorne Red, and shaded this with a Khorne Red/Black mix. I washed this into the folds and did several very thin layers so I could get varying degrees of darkness depending on the depth of the fold. After that I tidied up the transitions by using thinned down Khorne Red. Part of this was painting it on in a typical manner, but in other areas I almost used it as a glaze to soften the transition from the shading to the base color. To highlight it I mixed in Tau Sept Ochre and did two layers of very fine and controlled highlights. The skin was a challenge since I have only painted an Asian skin tone once before. I ended up going back and forward between my stages until I was happy with it, but the main colors that went into my mix were Tallarn Flesh, Cadian Fleshtone, and Desert Yellow. It was shaded with Riekland Fleshshade and Rhinox Hide for the areas that really needed extra definition like the fingers and mouth, and highlighted by mixing in Screaming Skull. It's definitely a very pale skin tone, but I think it works, especially for a wizard as I imagine they don't get out much. Before moving onto the hate I painted all of the little odds and ends like his belt, hair, socks and the scrolls. There was nothing fancy here. The hate was left off when I painted the model so I could get to the face. Now that it was time to paint it though I glued it on so I would have something to hold onto. I base coated it with Rakarth Flesh and then washed it with Seraphim Sepia. 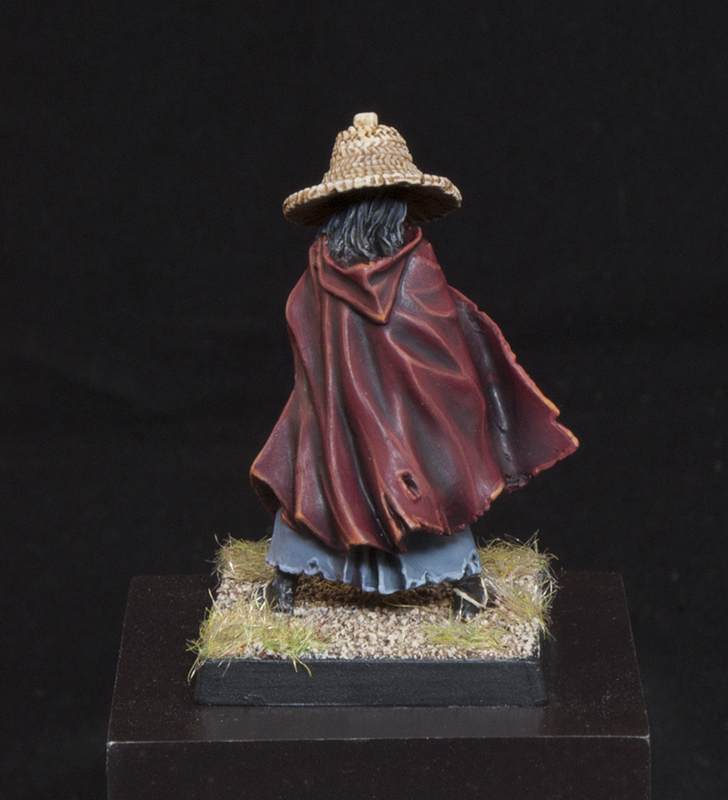 I also did a light wash of Agrax Earthshade where I wanted some stronger shadows. The whole thing got an overbrush of a Desert Yellow/Screaming Skull mix, and then was highlighted with another overbrush but with more Screaming Skull mixed in. An overbrush is similar to a drybrush, but with more paint on your brush so you avoid that chalky look. 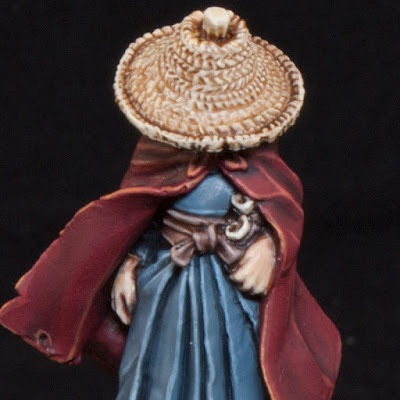 It does require a little more care on your part though, since there is a higher chance of too much paint coming off your brush onto the model and destroying your shading work. The sandals were painted in the same manner. With that all that was left was the base and then the model was done. 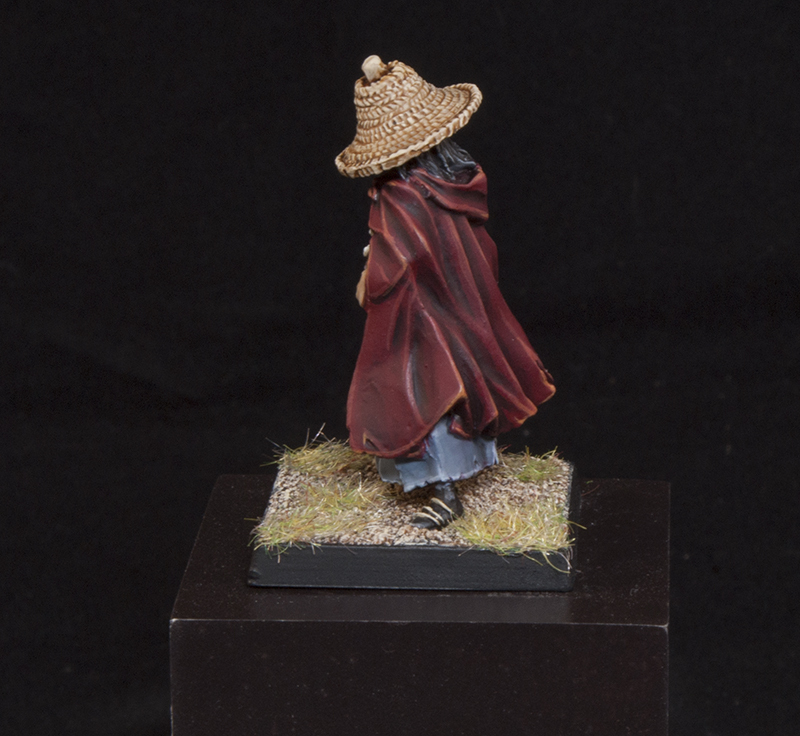 I think he looks suitably mysterious and I am particularly happy with his hat and cloak. 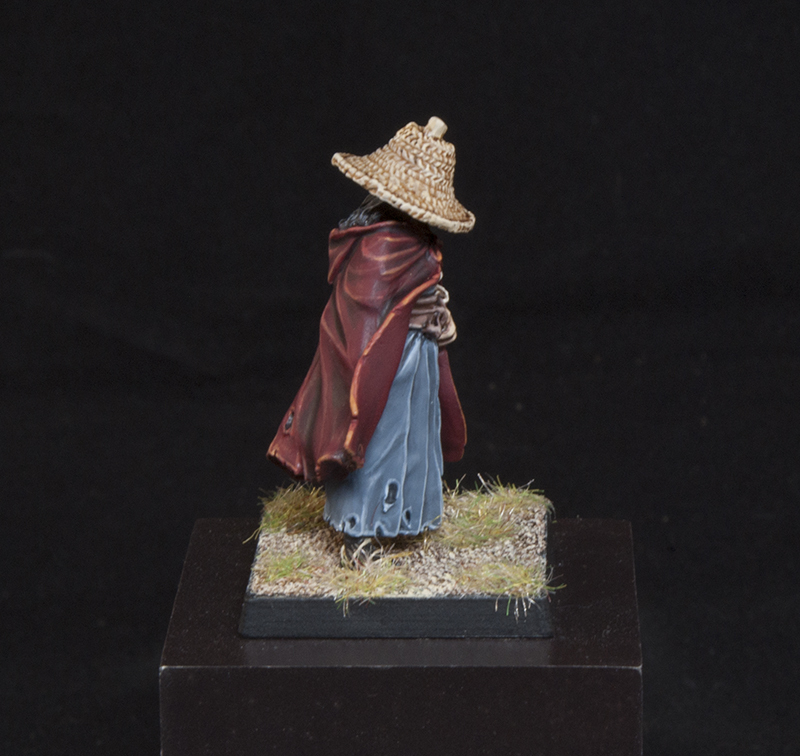 You can find the original miniature for sale on the Zenit Miniatures website here. You can watch a 360 degree video of the model below. The music is "Cambodian Odyssey" by Kevin MacLeod (incompetech.com).